Known as the "fear gauge," the CBOE Volatility Index (VIX.X shot to levels not seen since last February when the stock market was in free-fall. For how volatile Tesla (TSLA - Get Report) is, one would have thought that the young automaker's stock would have been decimated in February. Given the current circumstances surrounding Tesla -- CEO Elon Musk accepting a plea deal with the SEC isn't exactly great -- one would also think that this unpredictable stock would be extra volatile given the broader market's action last week. But that wasn't the case. In fact, Tesla has been rather resilient while the markets have been tumultuous. It did OK back in February, but it's been downright stable these recent trading sessions. Over the last five trading sessions, the SPDR S&P 500 ETF (SPY - Get Report) is down 4.5%, while the Nasdaq Composite is down 3.7%. During that same time, Tesla stock is up 3.6%. Also worth noting is how poorly other automakers performed during the same stretch, as names like General Motors (GM - Get Report) , Ford Motor (F - Get Report) , Ferrari (RACE - Get Report) and Fiat Chrysler (FCAU - Get Report) all underperformed the S&P 500 ETF. Ironically, there isn't any news propping shares up. The week prior, Tesla released its production and delivery results for the quarter. The results were impressive, as production increased 50% from the prior quarter. Although it's clear Tesla has now gone from a production nightmare to a delivery headache. However, we knew about that well before last week and Tesla stock is actually down since releasing those numbers. So to see Tesla stock rally as the markets fall and the VIX hit its highest level in nine months is impressive. So how do we trade it from here? 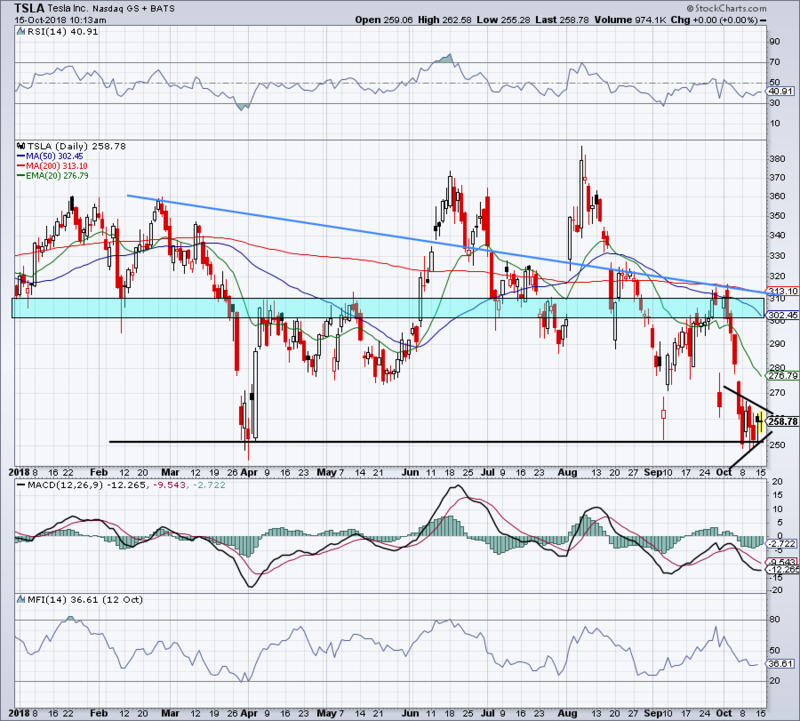 Above is a short-term look at Tesla, as we can see the $250 level continues to hold as support. In fact, shares are now forming a bit of a tightening coil down here, giving hope to the bulls that it's gearing up for a larger rally. If that's the case, Tesla will have its work cut out for it. On a rally, the $275 level and 20-day moving average could cause the stock to pause. However, if the move is strong enough, Tesla could easily push right through this market. By far the more difficult area to pass will be $300 to $310. This range has served as both support and resistance in the past, and I would suspect that at least on its first attempt, this range will act as the latter. Making matters more difficult is the downward trending 50-day, 100-day and 200-day moving averages all currently resting in this area. A prior downtrend (blue line) is also near the top of this range. All of these factors will make clearing $310 very difficult for Tesla in the short to intermediate term. 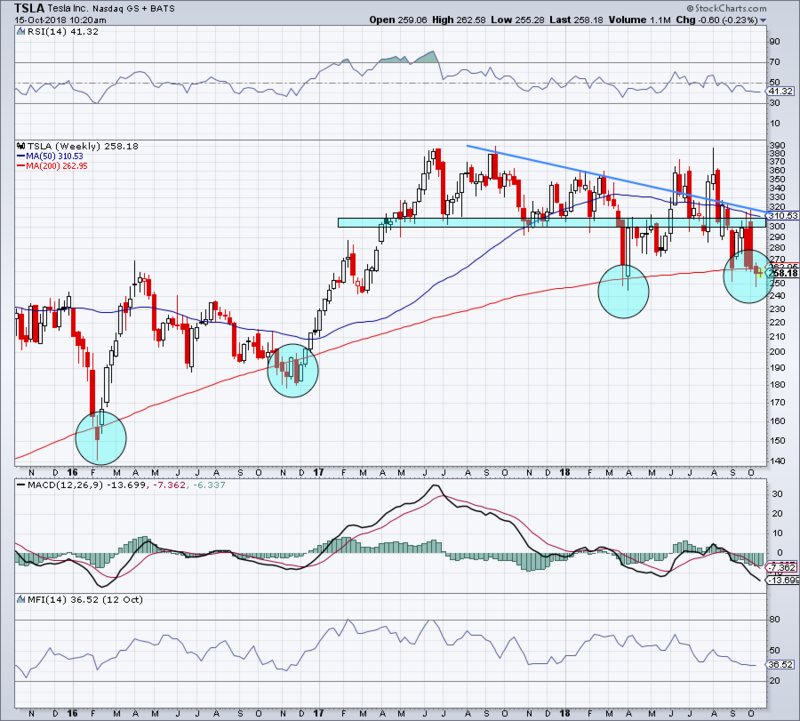 On the three-year weekly chart below, we can see how well the 200-week moving average has held as support. However, it also emphasizes the downtrends that loom above, currently near that $300-ish area. As we've seen in the past, a few candlesticks below this 200-week moving average doesn't spell the end for Tesla. But if it were to close below its 2018 lows on a weekly basis, I would be deeply concerned about a further correction in Tesla stock.